"A young lady like you shouldn't wander the streets of London, there are many dangerous crooks that wander the night..."
I doubt that any of my female bat Silverwing OC's would stand long after hearing what he has to say as they can easily see in the dark and fly away from most street dangers.Which includes the land dwellers that can't fly on their own without special equipment. Enter the Big Ben Caper. "Wait my friend was with me like two seconds ago.... DAMN IT!" LOVE IT! So devious and sinister! Me: *bats eyelashes* Mind portecting me from said ruffians Professor? Love the mood and his expression! Me: I'm not afraid, if you're trying to scare me, it's not working. I love the mood here! I just want old Rati to kiss me in such a set! Grace- You look so sleazy, like you're going to pounce on the young woman, you're a gentleman Gov! 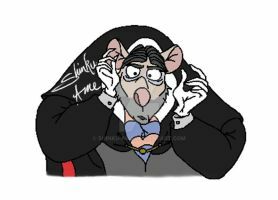 Ratigan- And you're a young woman...you couldn't hurt me if you tried! LOL, anyway, this is great! Awesome job! *click* Hello, Ratigan? You're not still pissed about that time I reduced to a pile of bloody rat flesh, are you? 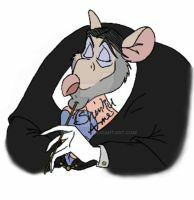 Ratigan: No, I'm not pissed. In fact I'd love to come over to tea...can I bring my shotgun? Ratigna: *frowns* alrighty, TO THE SOUTH POLE! Me: To the NORTH Pole! And I doubt that they had spaceships in 1896. Oh pooh, he can't go into space with you then!